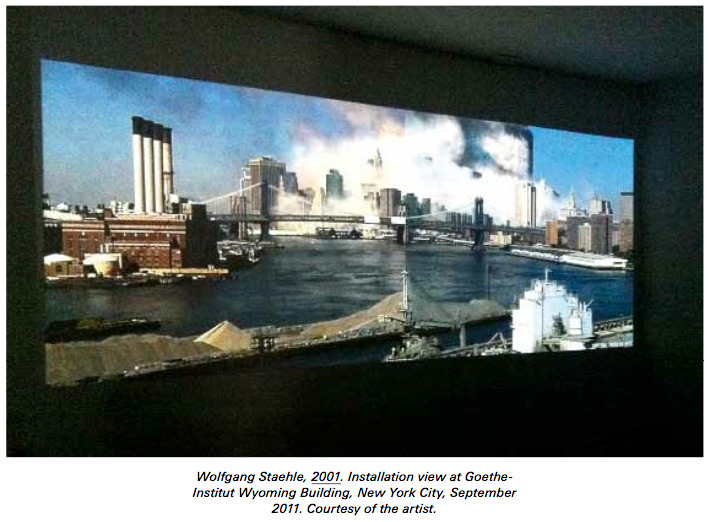 Ten years ago, when Wolfgang Staehle trained his webcam on Downtown Manhattan to create a live-video feed to Postmasters Gallery during his September exhibition, he had no idea that, by the 11th of that month, his work would meticulously record the day’s massive destruction and deaths, and would witness the opening of a new world-history book. Staehle’s 2001 (which, back then, included two additional synchronized, real-time projections transmitted from locations in the artist’s native Germany) was a live still-life of sorts, its inanimate (or, from a distance, imperceptibly animate) components being the urban architecture—in New York’s case the bridges, skyscrapers, and the FDr Drive. By 8:46 AM on 9/11/2001 the artist’s intended elegy to the seemingly eventless passage of time turned into an epitome of tragic eventfulness. Moreover, Staehle, whose work had meant to decry “spectacle,” was suddenly in possession of the very footage that most TV stations would covet (in order to ultimately promote spectacle). There are less than a handful of videos that happened to capture the first plane’s approach and piercing of the World Trade Center’s North Tower. Yet no matter the offers and interests, Staehle held on tight to his recordings. exactly a decade later, the Manhattan part of 2001 was shown as a video in the Goethe institute’s small east Third Street space. over the course of four days, starting on September 10th, visitors could watch the city’s Before and After all over again, yet this time knowing how a serene and absurdly carefree sky would soon turn all dark (along with parts of our collective outlook on life). it was like a glimpse at a distant yet sore past, mediated and unreal, just as many of us initially experienced that day. Staehle’s work did what it originally set out to do: making you see one random (yet fateful) day with an eye from afar and in the context of the progress and regress, destruction and rebuilding that humankind has forever been involved in. The silent, occasionally flickering image of the double projection suddenly falls in line with the many paintings or photographs of other infernos in history, perhaps rome, Constantinople, Hiroshima . . . and you can’t help wondering what kind of wisdom recurrence or hindsight have really given us. 2001 in 2011 was both painful and cathartic—as an unintentional allegory of life’s potential for disastrous turns but also as a memorial to the hidden individuals buried by the grand sweeps of history. * SABINE RUSS is a writer and BOMB’s managing editor.